Thanks Dave, I found it on the Pullman State Historic site. There are other good stuff there. I'm still working on the sawmill and trying to make some convincing logs for it. It is so small so the logs must be quite small for it to handle. The really big loads from rhe woods have to go elsewhere. 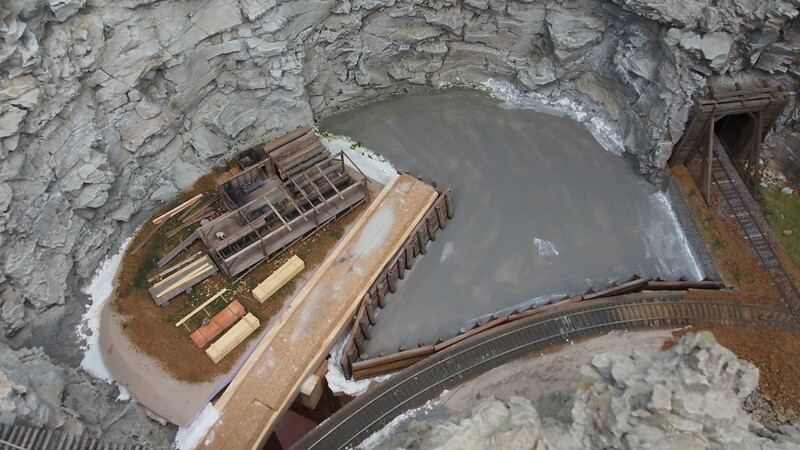 I don't have layout space for a larger mill so they have to be shipped out through the interchange. I'm away this weekend so no modeling. I usually have some projects with me but not this time so it will be armchair model railroading instead. I post some pictures when I come back home. They have some items "stating" HO scale. did you try small Pine branches? Tree Farms grow what they call a Swedish Pine for the holiday tree. It's branches scale well. I like the coal merchant wagon. 4mm though. just came back home and did some work on the sawmill. We have been away on a short holiday without any modeling so it was great coming home to the workbench. Bob I saw your suggestion and looked at some trees where I was staying but could not find anything useful there. But I'll go out tomorrow roaming the nearby forest seeing if I can find something. I have tried to make Redwood logs from balsa based on photos I found on the internet. 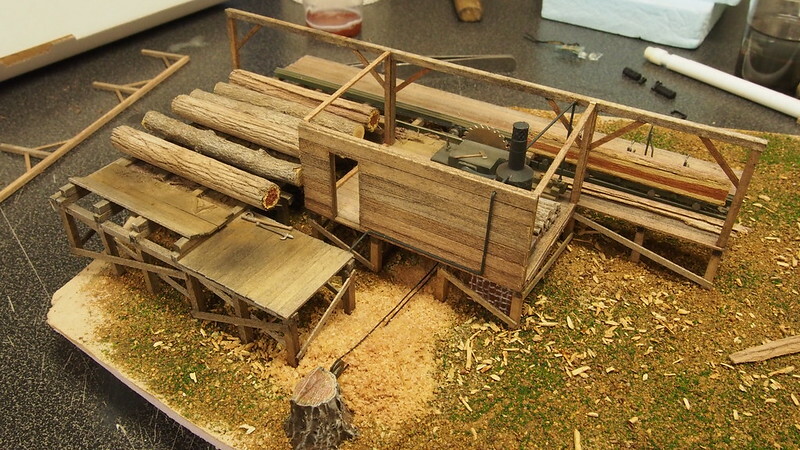 Here are how my sawmill looks at the moment. I have placed it on a base which will be blended in with the scenery later on. At the moment it has no roof as I'm working on the interior. The bark texture looks good. but the ends aren't working for me. The rest of the mill is looking good. 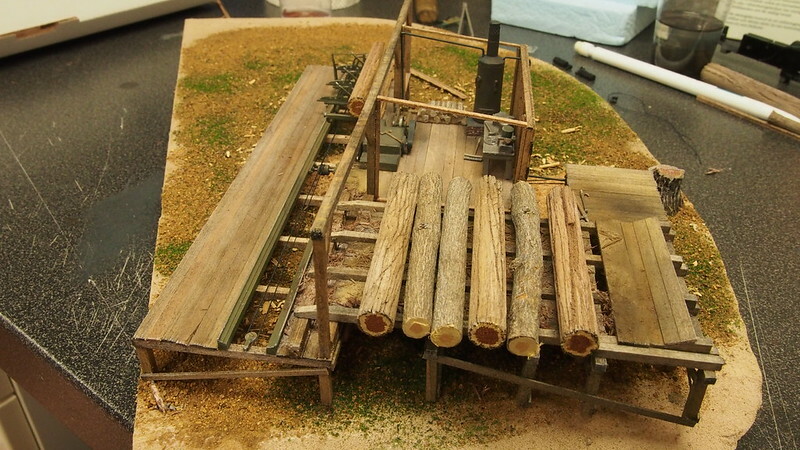 H�kan, I think your sawmill & logs look fantastic! Thank you for the encouraging words Greg! I made a new try with lighter color and toning it down with some chalks. 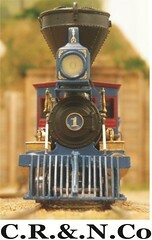 The photo below was taken under the layout lights which are a bluer. I think it is better with more rust in it. But, the ends are a little to uneven with the surface to rough. So off to some more experimenting. I wouldn't be so sure that the cuts are too rough. If your lumber jacks are using hand powered crosscut saws, the cut ends were rougher, as the hand saws don't make as nice, and smooth a cut as modern chainsaws do. Two men, push/pulling a saw will have false starts, hesitation marks, and splits as the tree begins to weaken. A modern chainsaw can cut fast enough to sever the tree before the structure of the tree fails. Hand saws did not. That is why there are often rough cuts into one side of the log, with a V cut, or wedge cut on the side the jacks wanted to direct the tree to fall, with a torn jagged edge in the middle of the log where the tree fell, tearing itself free from the stump. Again, all things to consider. H�kan, the ends look a lot better, but that picture you posted of the real thing adjusted my memory. Too much mush sugar pine is my eyes, I guess. Thanks Horse! I didn't thought of that. I looked to much on the photos I found. They are from modern times so they probably use modern tools. Thanks Bob, I'm not entirely happy with them but I have come to good enough. 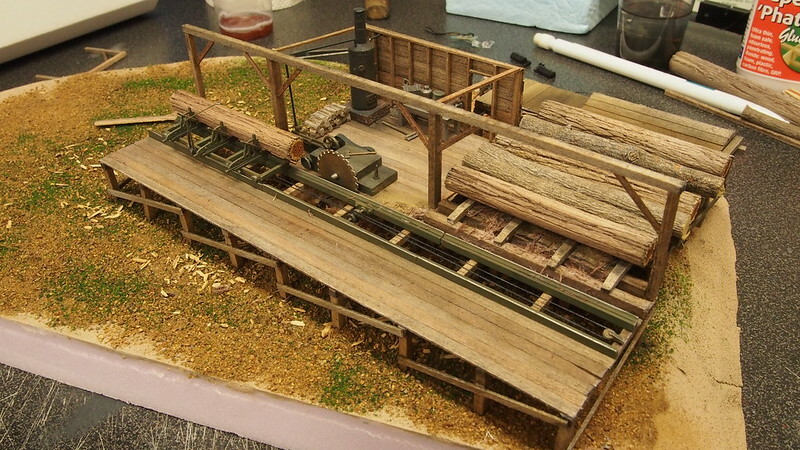 I must remind myself that the sawmill is about 1-2' in from the layout edge and everything is no that easily seen. How much room so you have behind the saw Mill before your back drop? Thanks again for the push Bob. To answer the question it was easier to get back home (we have been on a short vacation) and take some photos. 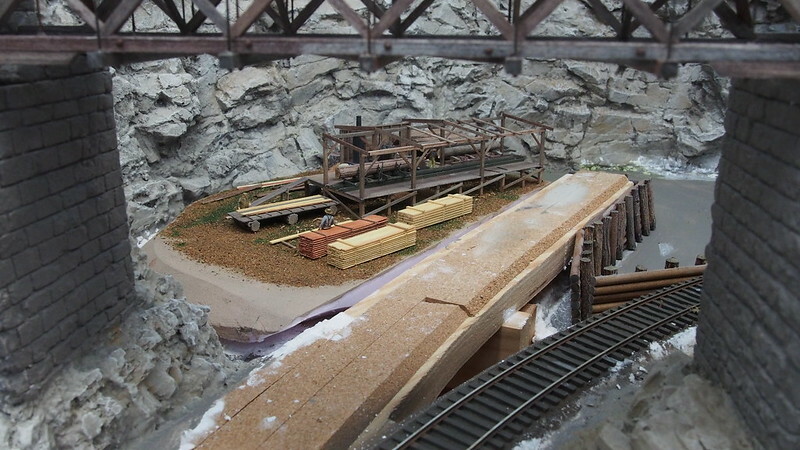 The layout at this point is very much mountains and rock so I have a rock face about 2-3" deep behind the mill. It is very compressed. I know, I know its a little spaghetti bowl over it but I wanted mountains with bridges and vertical separation and this was the place I could incorporate it. . I have made some more changes to the mill. 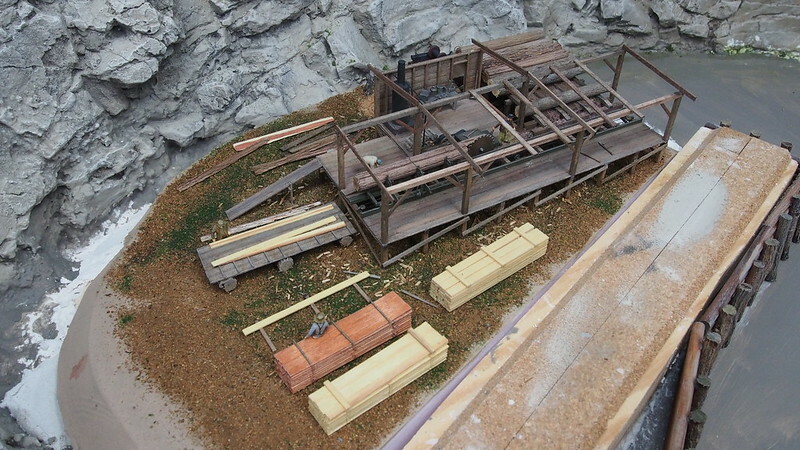 As it comes the kit has very limited space for the workers to handle the cut lumber and sorting them (Thanks for pointing this out for me Bob!). I looked at Youtube films with backwoods mill operations and it was quite rudimentary. I wanted it a little more "permanent" so I added a deck behind the collecting area (after the saw) and a ramp down to a sorting table. 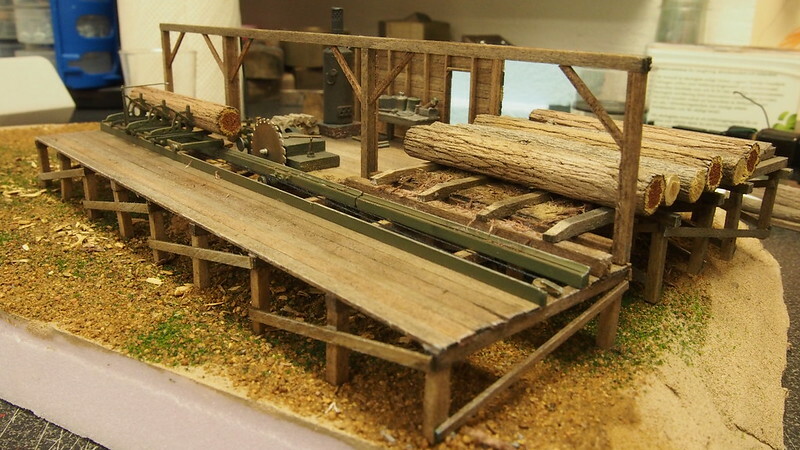 The sorting table is pure fantasy although based on some old working sawmills I have seen here and how they handled the sawn lumber. 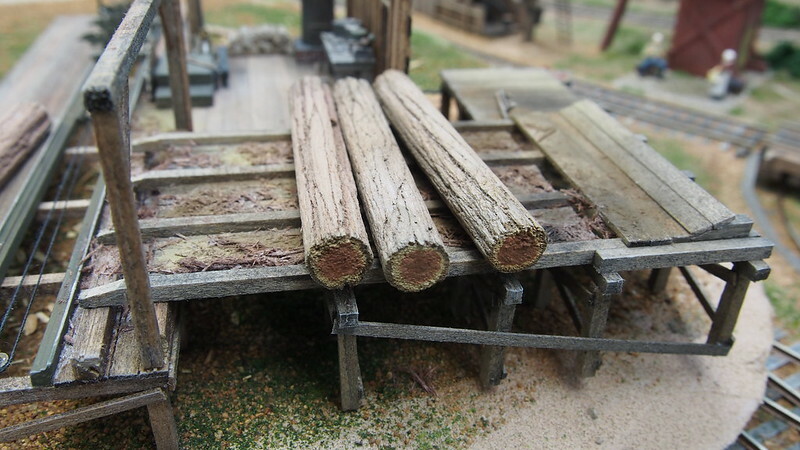 The pond surface came out a little to deep in relation to the rails and sawmill. I'm thinking on raising it about 1/2". The next scary part is adding water. I have experimenting a little with Fallers water product that seems similar to WS scenic water. I'm not overly impressed with it as it is quite easy to get air bubbles in it. It is also scary to paint the pond surface. I have looked at various ways to color it with much blue in it but as my day is somewhat overcast I'm thinking of making quite dark at its deeper parts with some green and brown to the shallower areas simulating underwater growth. Depending on how stagnant the water in the pond is, with the large amount of sap, and rotting leaves/needles for the trees, the water may appear very dark, even black. So, consider that if your pond is slow moving, in the area around your mill, the water may very well be black, as the tannins from the leaves/needles, and sap poison the water, killing off the normal plant life, and the rotting material turns very dark, leeching out dark, and black particles that contaminate the water.